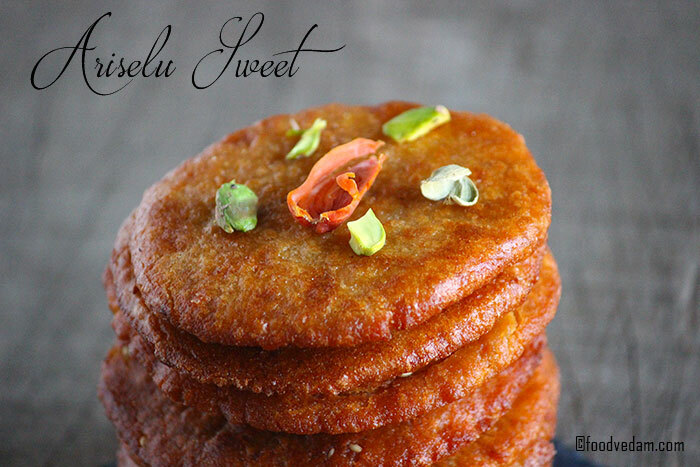 Ariselu Sweet Recipe with step by step instructions.తెలుగు వెర్షన్. 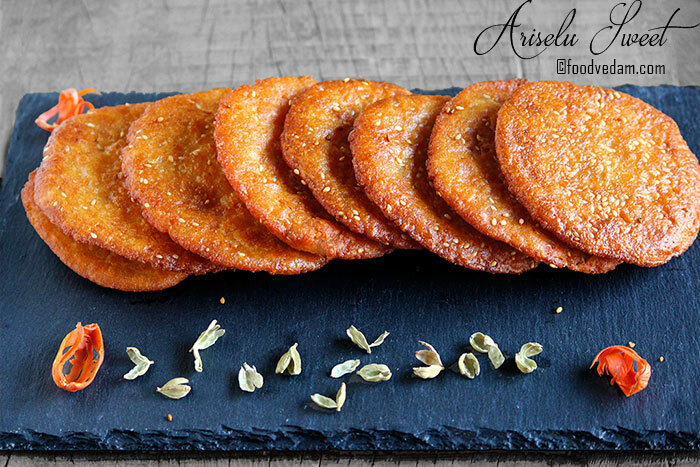 Ariselu is a traditional sweet prepared for Sankranthi Festival in South India.especially in Andhra and some Telangana Regions.There is a reason for making this recipe.Sankranthi is a harvest festival.all granaries are filled with rice.but the freshly harvested rice grains hold moisture and it is not good for health.it may cause stomach discomfort.so our ancestors had taught this procedure to use them in a proper way.and the sesame seeds in Ariselu help to balance the temperature of the body in the winter season. I usually buy Ariselu from nearby sweet shops.most of the times I had bitter experiences.they are too hard to chew.whenever I chew them I imagine myself as a dog chewing a leather boot.I almost feel like my jaw bones are dislocated.So I started making them on my own. 1.make sure that you soak the rice overnight. 2.if possible go to nearby flour mill so that you can get very finely ground rice flour.they may taste like eating crispy raw rice if the flour is not finely ground. 3.always keep the rice flour more than required.if anything goes wrong with the syrup you can adjust the consistency by adding the flour. 4.don’t pour excess water while making the jaggery syrup.just add a little water so that it turns into string consistency very quickly. 5.keep mixing rice flour to the syrup until it turns hard like chapati dough.otherwise, they absorb a lot of oil(because of the moisture) and become very hard to chew. 6.deep fry on medium flame so the inner part and outer layer are cooked properly. 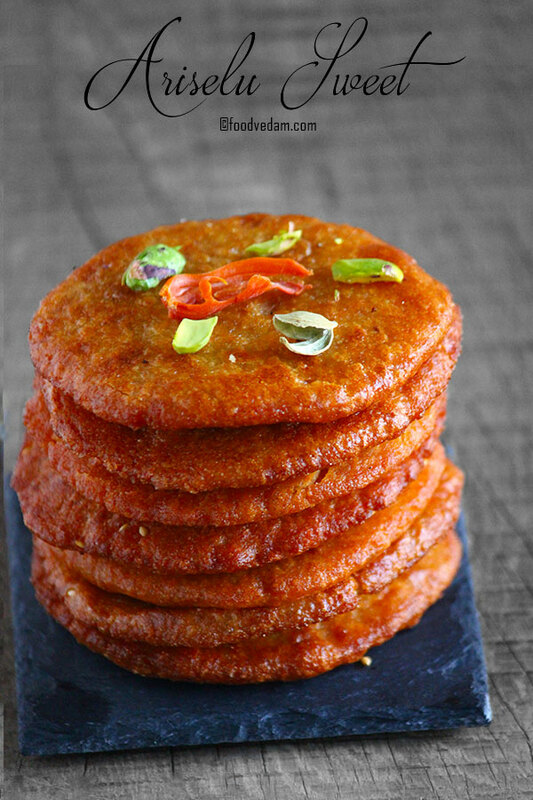 7.you need to add ghee to the jaggery syrup.ghee helps to reduce oil absorption while deep-frying.it also helps to retain the moisture in the dough until you’re done with deep-frying. 8.last one.please, be careful while flipping or squeezing out the oil.hot oil may spill on your body. Rinse for 2 to 3 times and strain out the water. Leave the rice on the strainer for around 10 to 15 minutes. Grind the rice in batches into a very fine flour and keep aside. Put jaggery in a deep pan and add 40 to 50 ml water so the jaggery melts very fast. Boil until the syrup starts bubbling. When the syrup starts to bubble, take a small spoonful of syrup and put it in a small cup of water. If the syrup doesn’t dissolve or if it turns into a ball when pressed with fingers then the syrup is ready. Add ghee, cardamom powder, and mix well. Add the rice flour little by little through the sieve to the jaggery Syrup. Keep stirring and keep adding the rice flour until the dough turns hard like chapati dough. Heat oil for deep-frying on medium flame. Take Arise sized lid with a plastic sheet placed on it. Grease your fingers and the plastic sheet with ghee. Take a fistful of dough and make it into a round ball. Pat it into a round flat shape until it covers the lid size. You need to dip each dough ball in sesame seeds before patting if you want sesame seed Ariselu. Drop it into oil carefully and wait until the Arise floats to the top. Fry for a minute and flip it over to the other side. fry until it turns to a nice golden brown color. Take out the Arise from oil and press it hard with two turner spoons until all the excess oil comes out.